As loath as we are to mention this, the school summer holidays are starting to wind down. “Nay!” say some of you. “Oh, thank goodness!” say the rest of you… especially if you’re having to juggle full-time work with entertaining the kids and finding childcare each day. Sometimes it feels like we need a holiday after the summer holidays. Whatever stance you take, it’s time to start gearing up for that first day back at school. But where does one start? How does one prepare? What does one need to buy? Getting ready for a new academic year is often just as (or more) overwhelming for parents than it is for kids, so we’ve compiled some helpful little tips below to (hopefully) make the transition a bit easier for the whole family. The countdown begins—stay calm and carry on to the school gate with confidence and ease! Much like returning to work after a long weekend or vacation, kids also need time to adjust to their early starts and new daily routine. The lazy summer days are almost over, so it’s important not to shock their systems too much! The best way to get the new school year off to a good start is to set up a bedtime and morning routine in advance. Get the kids used to going to bed earlier at night and getting up earlier in the morning, preferably a week or two in advance if you can. By the time the first day of school arrives, they will be back into the right sleeping schedule and energised for a full day of learning. 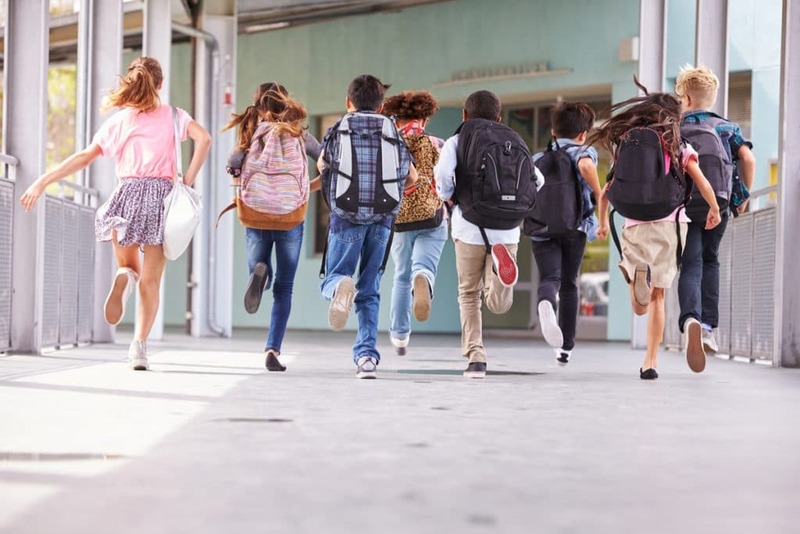 Whether you need to buy a uniform or suitable school attire for the very first time or for a move to a new school or different academic year, getting new clothes and school accessories is always pretty exciting for kids of all ages. Think back to when you were at primary and secondary school—didn’t you find it so much fun choosing a new pencil case and stationery, a cool lunch box and school bag, and shiny new shoes? Shopping is one sure-fire way to get children looking forward to going back to school and feeling positive about their return. And it needn’t cost a fortune—you can get some fantastic stuff at very reasonable prices in the supermarkets and high-street stores. And if your kids are into vintage… even better! There are plenty of great retro boutiques and second-hand stores around where you can get some unique, top-quality clothes and accessories for bargain prices. No matter what age we are, lunchtime is one of the best parts of the day. As is breakfast, snack time, dinner time… just any time when food is involved, really. Preparing an exciting packed lunch menu is an opportunity to ensure your children are getting the healthiest choices throughout the day, helping to keep their energy and brainpower flowing. Very few of them can be trusted when out of sight and left to their own devices! Have a chat with them and ask what kinds of foods they would most enjoy eating at lunch time (though you may have to ignore/alter some of their suggestions!) and then plan out a tasty and varied packed lunch menu with lots of fresh fruit and vegetables, nuts and dried fruit, protein-packed snacks, and other delicious and nutritious items to see them through the day. Even the happiest and most confident of child can get nervous before starting the new school year. It’s the same for us adults when we get a new job—it’s normal and usually nothing to worry about. Nevertheless, it’s good to talk openly with others about any concerns we may have. We almost always feel better for doing so, and it’s no different for our kids. Start the conversation by asking what they are most excited about and if there is anything they are unsure or anxious about. By having a relaxing chat about expectations, nerves, and worries, it gives them an opportunity to express their thoughts. That way, you can help to ease any concerns they may have and get them feeling positive and confident about the new school year. If your child is going into P1 or making the move from primary to secondary school, it’s also good to talk to them about bullying. As much as we don’t like to think it will ever happen, it’s out there, so best that they understand the correct way to treat their classmates, what to do if they experience bullying, and what to do if they suspect that someone else is being bullied. Routine, routine, routine. It’s what keeps us all sane and organised! Before the new school year, sit down with your child and work out a strategy and timetable for doing homework, relaxing and having fun, and preparing for the next day. Going to school for the first time or returning after a long summer holiday can take a bit of getting used to, so this will help your child to cope with homework, deadlines, and responsibilities. Create a plan that works for the whole family, but allow your child to take some ownership over their schedule—when do they think would be the best time to do homework, see their friends, do their hobbies? This gets them thinking laterally, learning to plan and manage their time effectively, and feeling like they have an element of control over their situation. Before you know it, they’ll be waking you up in the morning and checking that you’re prepared for work. If only. This one is just for parents. Your summer has no doubt revolved around the kids, so you’ll be ready for a little bit of ‘you time’. Book a day off work for when the new school year starts—relax and enjoy some well-earned peace and quiet!